We just added the Original Rider Waite Tarot Pack to the website and our eBay and Amazon stores. It is a great starter pack for those just learning Tarot readings and also a great collectors item to add to your collection for those who collect Tarot cards. These cards are a reprint of the original cards illustrated by Pamela Colman Smith, with original coloring and the original backs of the cards. Comes with a complete 78-card set of the Rider Waite cards, a fully revised and updated The Key to the Tarot by A.E. Waite and a chart to guide with the Celtic Cross spread. We have new sage smudges for the harvest season! We also have fresh Cedar, Juniper, Desert Sage and Sweetgrass for smudging. It is a good way to start the fall season, get your home ready for guests and lots of indoor activities! This is a wonderful tapestry of thoughts about scent, time and mindfulness. Too good not to share! There is a scent on the wind that unearths the past. It whispers tales of forgotten lands once traveled yet faded to the far corners of the mind. It conjures ancient memory, times long removed from us, but inherently part of who we are. This is the petrichor of the mind, revisiting us on the winds of life. It is said that the olfactory is one of the more primitive parts of the human body. With one scent we can recall a specific day of our past, a perfectly visited moment spurred to the front of the mind. Sometimes, the past travels on the wind. A stoic reminder of life lived yesterday. 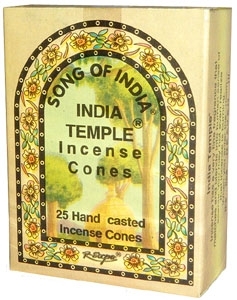 Great Fall Incense recipe for you! Like the Lemongrass Essential Oil from Auroshikha, there are several scents that have a calming effect on people. Calm and agitation all begin in the brain with a release of chemicals in response to a thought or situation. It goes to reason that there are things that trigger a calming response and one of those is scent. Scent is a powerful initiator of memory and emotion. Scents can be delivered using different vehicles such as via incense, via essential oil in a burner, via essential oil put on the body or through simmering whole herb in water *steam method*. Each delivery method has different results depending on the system used and the person using it. Some scents used to initiate a calming response in the body are Lavender, Chamomile, Lemongrass, Sandalwood (promotes calm by encouraging a singular focus, thus quieting an excited mind) or really whatever else calms you. Perhaps a certain scent evokes memory of happy times and places. Just that happy memory will release the “happy chemicals” in the brain and calm agitation. The vehicle you choose to deliver the scent can also play a part in the calming process. Sometimes watching a single, wispy, strand of incense smoke curl up into the air is enough to calm the mind and body. Some people don’t like smoke and prefer a water bath essential oil burner. Sometimes, if you are going to be out and about, enveloping yourself in a protective atmosphere of scent can provide that portable calming scent that is needed to get through stressful situations. Sometimes it is nice just to put a tiny bit of essential oil in with your face cream and apply it to the face or apply some to your hair so only you can smell it. It is amazing what scent can do for you in your daily life. It can reduce stress and initiate calm when you need it. It can also be used in many different forms and ways. Let your own inner voice guide you as to what and how to use scent in your life. Life is what you make it; you have choices so why not make it great? As always be safe with using essential oils and only use oils and incense as directed. Please leave a comment and let us know what scent you use to encourage that calming response in you!